Here’s a little piece of advice. In the months leading up to your due date, grab something sweet from the freezer (my personal fav are those tasty Girl Scout Thin Mints), plop yourself in front of the computer and scour the Internet for baby finds. Once that little one arrives, those marathon computer sessions disappear. Who am I kidding, I still manage to get online during nap time for a little retail therapy a couple times a week (gotta love shopbop, intermix and good ole’ bluefly) But why not pick out your baby’s birth announcement ahead of time or at least have a few options in the hopper? Erin Condren, a cool So. Cal Babe, created an amazing line of bright and quirky stationary filled with announcements, personal note cards, labels and even a growth chart! I love that she is a fellow UCLA Bruin too. I could go crazy on her site ordering stuff for the whole family to enjoy. If you fancy a little letterpress, a centuries-old printing process, then you will love the artfully modern designs of Dauphine Press. 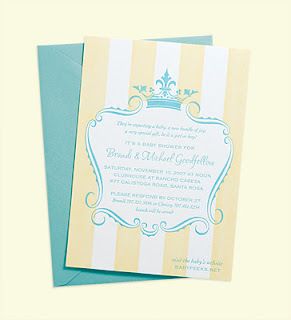 Founded by a graphic designer these cards have a vintage look and feel. It’s pure old-world elegance. 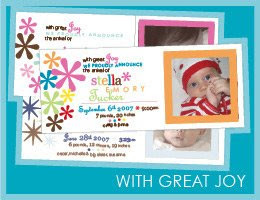 And don’t forget to order some thank-you notes too! Those baby gifts start rolling in right away. I’m a big fan of the Margot Madison collection of note cards. 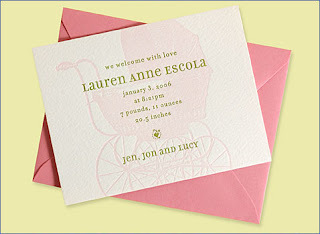 The custom patterns are printed inside the envelope and on the back of each card. So cool. For only $22.50 you can’t go wrong!